Hobbesy's Fancy Scenery & Co.
/ Hobbesy's Fancy Scenery & Co. These are all the maps I've ever made. Feel free to edit or take pieces from them as you want. This is a dark, cold map made for slugging it out in World War I style warfare. The parts picture are mostly no-man's land, but feel free to expand it as you see fit! These two maps probably wouldn't be incredibly useful for an actual map. They were more as a test of style and color I guess. A small desert map I made for a Civ on FPPW. It unfortunately didn't go very far. An edit of my Northwestern map for an RP. It also didn't go anywhere. This is the first map I made. It's pretty big, and most of the buildings are too small. You'll probably want to crop it if you're going to use it for a match. Re: Hobbesy's Fancy Scenery & Co. I really like the pw_northwestern one, but why is there a big pool of eyesoring blackness under the grocer's instead of the other oil (It's oil right?) pools? Because I'm dumb and used the wrong colour. I'll fix it in a second. Now you too can fight against evil corporations in a dystopian cyberpunk future! So, I realized that Blade Runner had no grey in it at all. You can sprite up a neon sign if you want, and I'll put it somewhere on the map. My only problem with this map is that the fighting would be very... Flat. Just direct straight lines from each end of each floor, heck - between buildings too. That'll change when I add in the floaty bits. I would suggest making some multi-story lobby areas in the buildings, or possibly some curved areas. That would be a welcome change from the default blocky city tone. I was thinking of replacing the building on the far right with a night club of some sorts. Hobbesy, I must add my troops into a billboard somewheres. ooh nice anarchy/marble hornets symbol.. I thought adding in a little dying planet would make the map a bit more interesting. Story on why there's a sandstorm engulfing a futuristic cyberpunk city and arrows that don't stick out as much after the jump! The backdrop should be a little more detailed. I'm really liking where this is going man! 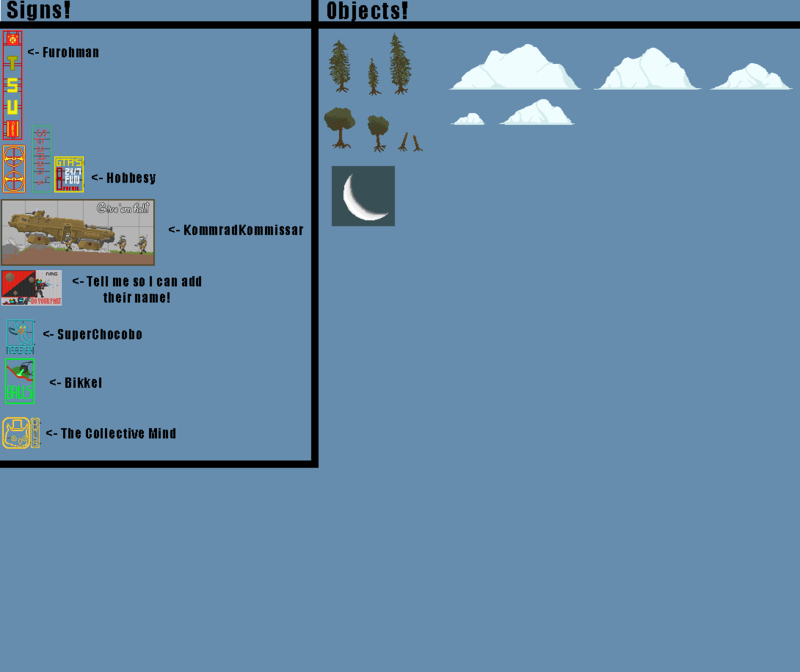 The actual map is pretty much done unless I get some great idea for it. Time to get to work on that background! this, maybe add a few rotting bodies/skeletons? Are those bill boards or huge T.V screens? You could say they're both. I've done most of the things Metal suggested, and I made the worthless stairwell into a collapsed building, but I haven't had much time to do stuff recently.